A natural pick-me-up to any session...with a bit of earthy, classy, sassy, sultry. Swell and honest when it hits your ear. Serves wonderfully warm as well as cool. A top pick. Many moons ago, Margo voiced “The Song of Hiawatha” on Detroit’s PBS station, and that grammar school gig foretold her VO future. There were drama classes and plays during school days in Michigan, too. Post-college (University of Michigan and UCLA), Margo landed as press manager/writer for NBC and Nickelodeon, where she publicized scores of shows from “Cheers” to “Rugrats.” Then, in 2009, after training with top VO coaches in Los Angeles, she blended her persuasive, interpretive and acting skills and stepped behind the mic full-time. Her lengthy credit list includes TV and radio spots, as well as narration, explainer and e-Learning projects. 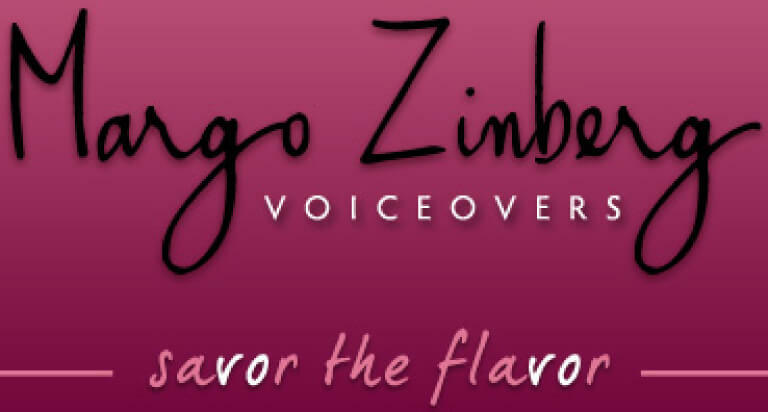 Margo is an accredited member of World Voices Organization and Voxy Ladies. Off-mic, she kicks up her heels tapping with the Diane Davisson Dancers. "Very easy to work with...prompt and professional. Voice work was fantastic. I would definitely recommend Margo’s services." — Ryan Stott , Five-Star Christmas Tree Co.
"Margo consistently delivers a perfect project for us every time. Very happy client here." "Your takes were absolutely killer! We finished our production and the spots are running on TV." "Both clients 'loved' your voiceover. Me too. Thanks for great work and fantastic turnaround time." "Margo was great to work with - even when the script when through a few revisions on the client side. She kept up quick responses and great reads. Excellent work." "So fantastic working with you! You're an all-star! Much appreciated!" "I'm extremely happy with your performance. Great work!" — Dan King , King Advertising , Inc.
"Margo was a pleasure to work with. She was responsive, communicative and accommodating. She completed and delivered her work quickly and at the highest quality." "Thank you Margo! You were extremely professional, helpful, prompt and expedient. Your read was great!" "Margo is a top notch professional and I am proud to have her on my team at SpoonDrawer Media Group." "Good stuff: nifty voice quality, interesting background, good training and you can act — damn!" "Her turnaround time is excellent as well as her attitude and enthusiasm for her work. She consistently delivers a perfect project for us every time. Very happy client here!" "Great work on the web video! Casual but confident, relaxed natural pace and very professional." • Includes Harlan Hogan’s MXL VO-1A microphone, MicPort Pro, and Harlan Hogan Voice Optimized headphones. • Plus, easy access to state of the art recording studios in Los Angeles with ISDN, phone patch and Source Connect. • And AudioTechnica 2035 microphone with PortaBooth for travel.